During your holidays at the camping Les Voiles d’Anjou, come and explore the Loire Valley, which is listed as a UNESCO World Heritage Site. The whole family will just love the huge variety of activities on offer here too! See the legendary châteaux of the Loire and the troglodyte locations here; have loads of fun in the famous amusement parks in the region; wonder at the animals in the zoos; culture and lots to discover in all the museums; plus introductions to winemaking and wine tasting. For a really unforgettable time, choose Yelloh! Village! Thrills and excitement guaranteed! From the best-known to the most secret, from mediaeval fortresses to Renaissance properties, they all bear the traces and the memories of the history of France. Whether you are looking to discover animals or if you are after some thrills, the Val de Loire region is a giant playground of zoos and theme parks. Discover the cultural treasures of the Loire Valley: monuments, museums, troglodyte sites will reveal all their secrets to you! The troglodyte sites of the Loire Valley, Rochemenier, Forges, La Cave aux Sculptures, etc. Your holidays will also be a time for nature, getting away from it all and discovering lovely outdoor activities. The vineyards of the Loire Valley, visit the wine-growing estates of Saumur-Champigny, Layon, Savennières, etc. You can start discovering the Loire from your saddle just 800 metres from the campsite. There is an 800-km circuit along which you can ride and admire the last wild river of Europe. One of the most ideal ways to discover the Loire with your family is by bike away from the hustle and bustle and along safe routes. There are a number of different circuits that allow you to discover nature and all the treasures of the Loire Valley: the castles, enchanting villages and vineyards. You can also discover “The Authion by bike” in the Loire Anjou Touraine Regional Nature Park. There are other circuits not far from the village in the Loire-Longué district where you can admire the forests, the countryside and the banks of the Loire. 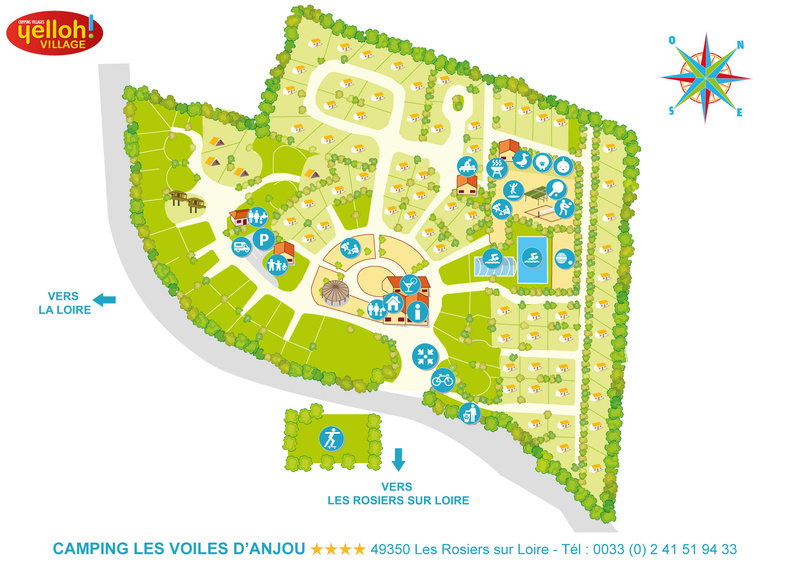 Families can rent bikes in the village of Rosiers-sur-Loire and in Gennes.